Low range pressure sensors, gauges, loggers and calibrators for measuring low pressures on filtration systems, ventilation fans, air conditioning & handling systems. These instruments are used for measuring very low pressures in applications such as on building management systems to control the distribution of air throughout the building, for ensuring a small difference in air pressure between two adjoining labs to prevent contamination, or for monitoring the increase in pressure across a filter to indicate when the filter should be cleaned or replaced. 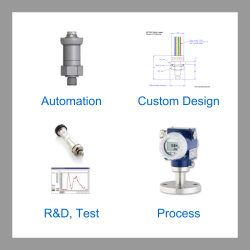 Browse low range pressure sensors and instrumentation by product type. Low Range Voltage Output Pressure Transducers- Low range amplified voltage output pressure transducers with highly sensitive sensing diaphragms for measuring low pressure readings, and sending a voltage output signal which is proportional to the required low pressure range. Low Range Pressure Gauges- Pressure gauges for testing and monitoring low range air or liquid pressures. Choose a pressure gauge for displaying low pressure measurement readings in different pressure units such as mbar, hPa, kPa, psi and inH2O. Low Pressure Transmitters- Low pressure transmitters with 4 to 20 milliamp current output for measuring low level gauge, differential & absolute pressures below 1 bar (15 psi, 400 inWG or 1000 mbar). Low Range Pressure Sensors- Low range pressure measurement sensing devices. Low Pressure Range Intrinsically Safe Pressure Transmitters- 4-20mA current loop output pressure transmitters with intrinsically safe (IS) certification, and low pressure scale operating range. Analog & digital output pressure sensors for measuring low range pressures. Low range pressure transmitters with 4 to 20 mA current loop output for the measurement of low level gauge, absolute and dp pressures. Low range pressure transducers with a choice of high voltage output signals such as 0-5V, 1-5V, 0-10V or 1-10V for measuring low level gauge, absolute and differential pressures. RS485, RS232 and USB interface sensors for accurate measurement of low range differential or vented gauge reference pressures in applications such as air ventilation systems and laboratories where ambient air pressure is controlled to prevent contaminants entering or leaving a work area. Battery powered digital pressure gauges for testing and monitoring low range air or liquid pressures. Instruments with built-in memory storage for recording low gauge or differential air pressures. Test performance of ventilation systems or clean room air control by monitoring pressure at set time intervals. Export data to another software program for analysis or print out results for quality audit purposes. Low level pressure range calibration equipment including hand pumps with fine volume adjustment for precise setting of low pressure calibration set-points, and high accuracy pressure indicators to use as secondary calibration standards. Measuring low range pressures is typically necessary on systems that transport air or gases such as building ventilation and factory dust or fume extraction. In order to move air or gas from one place to another, a differential pressure difference needs to be created which causes movement in the direction of higher to lower pressure. Only a relatively small difference in pressure is needed to create sufficient movement of air or gas, which is a good thing because too high a differential would cause problems with noise and opening of doors in a workplace environment. The size of low pressure measuring devices tends to be larger than equivalent higher range ones, this is because lower pressures produce less deformation in the sensing material, and therefore a larger surface area is required to maintain sensitivity of measurement. A thinner material is also used, but this is often limited by the technology and strength of the active material. Due to the larger surface area and thinner sensing material used in low pressure sensing devices, it is necessary to downgrade the accuracy performance compared to higher ranges, because they are more sensitive to external environmental influences such as vibration and temperature changes. Pressure units which are used to describe low pressure ranges include pascals (Pa), millibars (mbar, mb), hectopascals (hPa) or inches of water column (inH2O, inWC, inWG, “H2O, “WC, “WG). 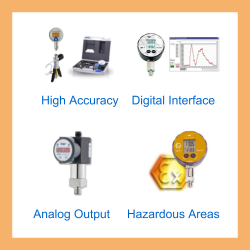 Articles with more information on low range pressure measurement products & applications. We want to measure the change in pressure on a tunnel wall as a train passes through it, we expect the pressure change to be as high as 2.5 kPa. Would it be best use two absolute or one differential range pressure sensor to measure this? Where possible always use a differential range pressure sensor to measure a pressure change that is much smaller than the baseline total pressure. If you use an absolute range pressure sensor it will have a range of ~120 kPa absolute and therefore the accuracy at the 2.5 kPa is going to be very poor, and thats before you have considered the additional error of subtracting the other static reference reading. If you use a differential pressure sensor with a low pressure range of 2.5 kPa you will measure the change directly and to a much higher accuracy. Will long pipework affect low pressure readings? Long small bore pipework will dampen pressure readings if the pressure is changing rapidly, so ideally you want to mount the sensor as close as possible and keep the pipework as short as possible, particular on connections which will have very dynamic pressures. Will trapped water affect low air pressure readings? Water trapped inside small diameter pipework used to measure a low air pressure will cause unexpected pressure changes due to the water head pressure and meniscus force effects. A slug of water in a vertical section of pipe will contribute a slight pressure on the trapped air inside the pipe. Also the surface tension generated by the air/water interface will contribute a force known as capillary action, which will cause a slight increase or decrease in pressure. Send us your enquiry for a product associated with this Low Pressure Range page, and get assistance with selecting a product for your application.